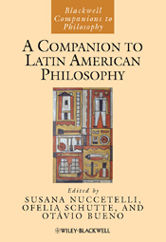 This comprehensive collection of original essays written by an international group of scholars addresses the central themes in Latin American philosophy.Represents the most comprehensive survey of historical and contemporary Latin American philosophy available today. Comprises a specially commissioned collection of essays, many of them written by Latin American authors. Examines the history of Latin American philosophy and its current issues, traces the development of the discipline, and offers biographical sketches of key Latin American thinkers. Showcases the diversity of approaches, issues, and styles that characterize the field.